Eats: Half Price Fraps Promotion@ Starbucks, Malaysia. Do you have a Starbucks Card? 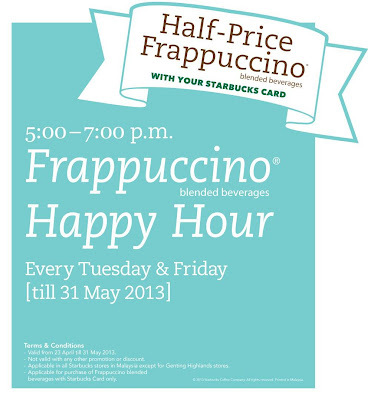 Then enjoy half-price off your Frappuccino blended beverages every Tuesday & Friday. Promo starts today till 31st May 2013. *Valid from 23 April till 31 May 2013. * Not valid with any other promotion or discount. *Applicable in all Starbucks stores in Malaysia except Genting Highland stores. *Applicable for purchase of Frappuccino blended beverages with Starbucks Card only.